The Brown Swiss Sale Service had it’s foundation laid by Vidian (Vid) B. Vye on November 9, 1934. Together with Vernon Hull and Herman Schmitz, he ran the first Royal Sale. In January of 1936 Vid seriously went into managing Brown Swiss sales. From his Waukesha, Wisconsin office, Vid also ran the National Pedigree Company. Pedigrees were compiled on Brown Swiss, Holsteins and Guernseys. A high light of Vid’s management would have been the September 3, 1945, Jane of Vernon National Sale. The sale average of $1,386.44 would covert to $18,000 average today. Mr. Vye passed March 5, 1947 due to complications from a heart attack suffered while skiing to work in January of the same year. Norman E. Magnussen had assisted Mr. Vye at several sales before his untimely death. Norman who with his brother Victor had recently purchased Norvic Farm near Lake Mills, Wisconsin, was asked to finish the sales that had already been contracted. 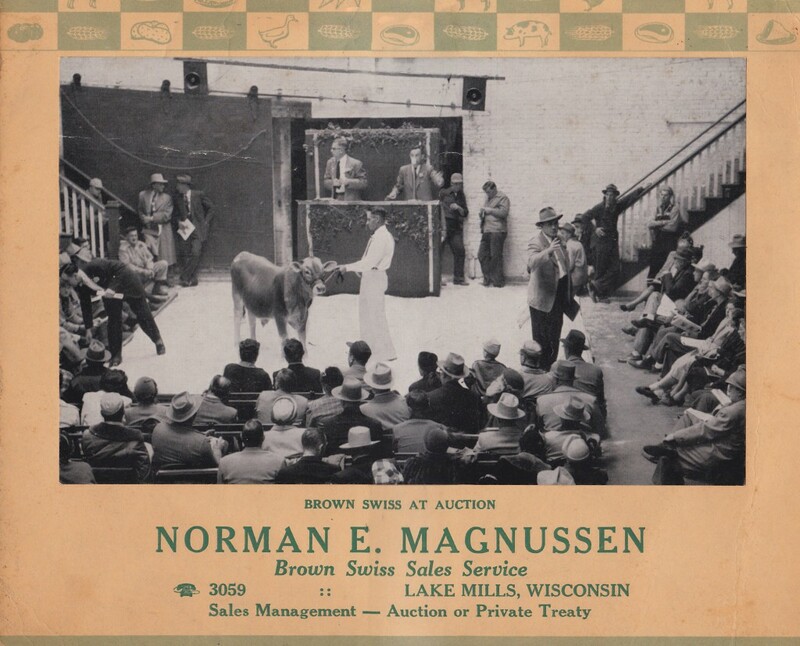 In July of 1947 the Brown Swiss Sale Service ownership transferred to Norman E. Magnussen. For a period of 29 years sales were managed in 28 states and Canada. On October 22, 1976 at the age of 65 Norman E. died suddenly of an apparent heart attack. At that time Norman C. Magnussen at the age of 22 took over the Brown Swiss Sale Service. For the last 39 years Brown Swiss Sale Service LLC has managed sales in 17 states including 17 National Sales. The World Premier Brown Swiss Sale held during World Dairy Expo always features top of the line cattle desired by breeders world-wide. Milking Shorthorns have also been added to the Premier Sale. While the name may say “Brown Swiss” all breeds of dairy cattle have been sold though this sale management. The Springtime Show Window Sale has been an annual event since 1948. The Harvest Royal Sale series is run the first Saturday in December. Dispersal sales are held on the farm or in conjunction with consignment sales. Off the farm sales are also run at sites that benefit the seller and buyers.